These New Forest coastal walks offer lots of variety, attractive scenery, plentiful wildlife and many connections with the rich history of the area, from smugglers to salt-workers and much more. All are within the New Forest National Park except, that is, for the short walk that starts at Eling tide mill and follows a circular route by Southampton Water. Two of the other walks are based on Keyhaven, an idyllic village in the south-west of the National Park. The first of these takes in Hurst Spit with its historic castle, and can be combined with a trip on the Hurst Castle ferry. The other follows a section of the Solent Way, a long distance footpath, along the sea-wall towards Lymington before continuing inland to provide a circular route that can be lengthened or shortened to suit personal tastes. The Solent Way is again used during a walk from the charming village of Beaulieu. This route follows the estuary of the Beaulieu River down to the picturesque 18th century ship building hamlet of Buckler's Hard, whilst another of the routes overlooks the Solent at Lepe Country Park. And finally, there is a short(ish) walk around Buckland Rings, a historic Iron Age hill fort situated a little inland from Lymington. This passes through majestic, mature woodland that now cloaks the fort's prominent ditches and ramparts, and crosses the central meadow that in days-gone-by formed the nucleus of the settlement. 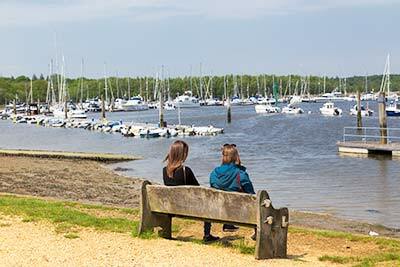 Enjoy a stroll or cycle ride beside the Beaulieu River from Beaulieu village to Buckler's Hard. (Take a break - a pub / refreshments are available along the way). Explore Buckland Rings, an Iron Age hill fort on the outskirts of Lymington. Start this fully accessible, medium length walk at Eling Tide Mill. (Take a break - a pub / refreshments are available along the way). Visit Hurst Castle, located at the end of Hurst Spit - walk 7 kilometres (a little less than 4½ miles) from Keyhaven to the Castle and back; or in season, half the walking distance and add variety to the trip with a one way ticket on the Hurst Castle Ferry. (Take a break - a pub / refreshments are available along the way). Take a circular walk from Keyhaven along the sea-wall and around the marshes. Select from a number of optional routes to adjust the length of the walk to suit your own individual preferences. (Take a break - a pub / refreshments are available along the way). Combine a visit to Lepe Country Park with a wander around the Lepe Loop, taking in coast and countryside along the way. (Take a break - a pub / refreshments are available along the way).